One question (more to follow I’m sure): what was your biggest/most worrisome anticipated breakage problem? What precautions did you take in regard to it (them)? The biggest worry was myself breaking down, physically. Precautions included careful judgment about what to do when, prioritizing boat/gear arrangement, and having a plan for if, regardless of best efforts, it happened anyway. My solution for repercussions due to exceeding physical limits is to stop, and wait for things to get better. The post titled Kneeling Camel, from August 4, is partly an example of that process. 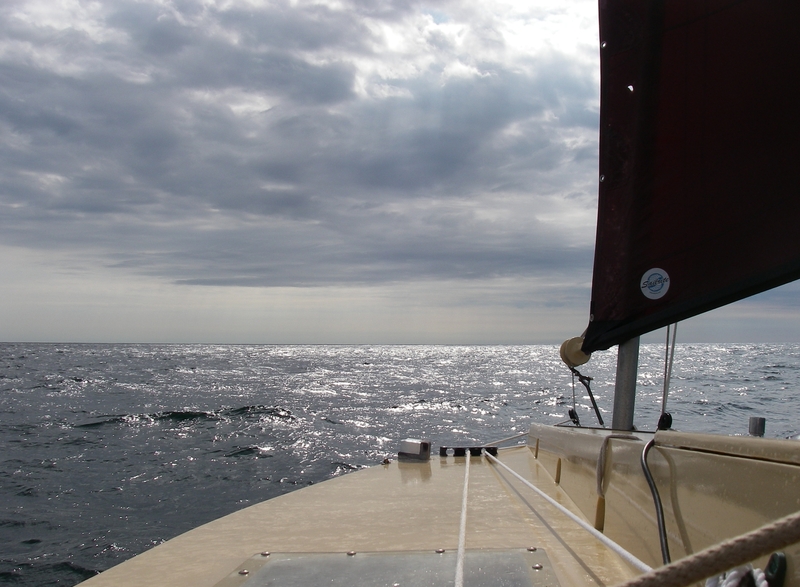 If something happened involving myself breaking down while I was on one of the big (for me) passages, my plan was to manage to fully reef the sails, once, and proceed toward a harbor at whatever speed the boat would do without my attention, strong wind or light. Or if the weather allowed, since I was completely supplied for many weeks, to stay out in a restful mode until things were better. Fortunately I didn’t have to put either strategy to the test. As far as mechanical equipment, I was most concerned about the autopilot, and as mentioned sometime before, I carried a spare. There is a problem in the plug/socket for the autopilot, with an intermittent loose connection that I thought we had fixed before departure this year, but it turned out that it still wasn’t right, but responded to jiggling the plug. I carried electrical tools, including marine crimp-on connectors and a ratcheting crimp tool, so that if that plug had completely given up I had the materials for a tight hardwired connection into the electrical system. That intermittent issue surfaced repeatedly, and was becoming more troublesome by the end of the trip, but I didn’t have to resort to Plan B, which I was glad to avoid because it had its own problems. The real solution is a more reliable plug, and driveway time for sorting it all out. Being prone to worry, and in a small boat with a half an inch of plywood between the inside and all that water, I carried quite a bit of stuff for emergency hull repair (besides having a sturdy, well-built hull to begin with): Pieces of plywood with holes drilled for lines to hold them against the hull, and two-part putty (“Splash Zone”) that can be applied underwater to layer on together with the plywood, or for use by itself for smaller issues. Also a tarp that did different jobs, but was available for sliding down the outside of the hull to stop water while making repairs. And one of those squishy orange cones designed for stopping up holes in boats. I also did “preparedness drills” in my mind, keeping track of locations of rags for quick stuffing if water was flooding in through a crack or break, and how to quickly get access to any part of the hull, or to block off an area so that only that section would flood. There is a range of bilge pumps on board as well, including electric and high volume manual. None of these strategies were put to the test, I’m happy to say. The trailer for that movie “All is Lost” that’s presently making the rounds scares me to bits, regardless, even though that guy is making so many obvious mistakes, and the movie is obviously set up to scare people. One of the things that gave me more immediate, real-life pause was the unstayed mainmast and the lightweight yard. Both held up fine, but I occasionally did practice runs in my head about what I would do if one of them, or the boom, were to break. I had the 12 foot push pole aboard, which with gentle use could temporarily substitute for the yard – and two masts, which were unlikely to both break, so there would have been someplace to carry some sail, to get over to shore. There’s calling Boat US/Sea Tow, being almost always relatively near shore, but how tacky! As it was I almost always reefed quite conservatively, partly because of these concerns. Gybing with too much sail area was another practice that I tried to avoid… I wasn’t always perfectly successful with that, and apart from general alarm, it was both interesting, and then heartening, to see that the spars all held up through a small number of pretty energetic clunks. At home in Holyoke we had both a replacement yard and boom, built at the same time as the ones I was using, in case they were needed. Sail chafe was a problem, particularly with the reefed sail rolled around the boom and then rubbing against the mast on a port tack. I carried sail repair tape, and used some. When I realized what was happening (after the first HOLE in the sail) I started varying the number of turns around the boom by a little bit every so often, to spread the wear. After two seasons of hard sailing, the mainsail is in serious need of attention (including a reinforcing strip where it presses against the mast), which it will get before any further sailing. Navigation lights… these were a problem last year, and a new tricolor was installed this year, but after the trouble in 2012, and less than satisfactory battery backups, I had limited confidence. The new tricolor worked fine for the whole trip, but I also carried a new version of LED battery powered nav lights, with lithium batteries, and mounting plates already installed on the boat (the new lights come with strong magnets for mounting when needed). The wired in anchor light at the top of the mast did quit, with evidence that the problem was at the top of the mast, so not easily accessible. I carried a battery light suitable for an anchor light, just in case, which I then used, and then Bill at Swans Island sent me off with one of his solar yard lights that also works quite nicely, and has the lovely benefit of turning itself on and off. I guess this response to your question includes at least as much about problems that actually happened and their resolutions, as it does about worries and precautions – that’s probably because it’s being written after the fact! Questions are fun – thanks!